Our company has more than 100 branches all over Great Britain, and we are looking for ways to automatically print the reports received from all these offices. Is it possible to print PDF reports on 100 network printers located in different parts of the country at the same time? 1) Go to Devices and Printers area of your computer control panel and make sure that all 100 (or any number of printers involved) are listed there. You need to install all the missing printers if any. 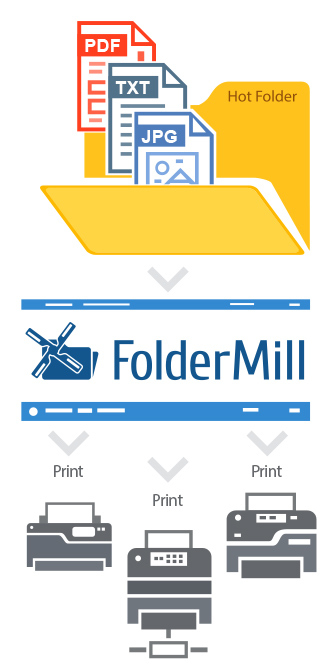 2) Download and install FolderMill software. Add one hot folder for watching it. 3) Add a new printing action for the hot folder. 4) In the action settings panel select the first printer from your list. Specify desired parameters, such as the number of copies to print, page ranges, collation status, etc. 5) Perform the same action for every printer on your list. 6) Click "Start" on the FolderMill main window. The software will now monitor the hot folder for all the incoming files, and as soon as the files are placed there, printing will take place automatically according to the preferences specified for every printer.